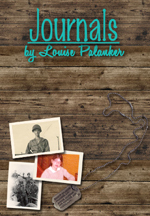 Louise Palanker’s 194-page love & war story Journals is written for middle school-aged readers. Description: “A young girl secretly discovers her father’s World War II, taking a forbidden journey into family history and learns that more important than finding the answers is being brave enough to ask the questions. Palanker’s Journals dares to ask the questions that tug at 10-16 year old kids or anyone who has ever been one.” The author’s storytelling alternates between the adult’s and child’s version of events. Read Chapter 1 for free. I found the follow questions to be such a good sampling of potential questions that can be used in a personal history interview that I am reposting the list in its entirety with a link to the the author’ s website at the end of this article by Steve Pender, President of Family Legacy Video, LLC. What to ask during your family interview: 45 questions to get you started! you may find the prospect of writing a list of questions a bit daunting. Don’t be afraid. You can do it. This article will help. usually spurs a second, the second leads you to the third, and so on. questions and get stuck, wondering what to ask next. The forty-five questions below are designed to help you with both these challenges. your creativity. Use what works and discard what doesn’t. Have fun composing your interview questions! 1) Please tell us your full name. 2) For whom were you named? What kind of education did they have? Do you have any special memories of them? 5) What can you tell us about your great-grandparents? How did they relate to each other? What was you dad like as a dad? What was your mom like as a mom? Describe your relationship with your mother and father. 7) Tell us about your aunts and uncles. Describe your relationships with them. Were you the eldest? The baby? Where did you fit in? Going from eldest to youngest, tell us the names of your siblings. What was each of them like? How did you relate to each other while growing up? What favorite childhood activities did you share? Did you have special chores? Describe your relationships as adults. How do you feel about your brothers and sisters? 9) What are your earliest memories? 10) Where and when were you born? 11) Describe the place or places where you grew up. 12) What were your houses/apartments like? 13) Tell us about your neighbors. Do any of them stand out? Why? 14) Were there any other children in your neighborhood? What kinds of games did you play? Did you enjoy any other activities? 15) Do you have any special childhood memories of your neighborhood? 16) Tell us about your pet or pets. 17) Who did the cooking in your family? Was he or she a good cook? Do any memorable meals (good or bad) stand out? Describe the kitchen of your childhood. How did meal preparation back then differ from today? 18) How were other chores, like cleaning and doing wash, different from today? 19) What did your family do for fun? What did a ticket cost? Who were your favorite movie stars? What films did you enjoy? What were your favorite shows? How do you think radio compares to television today? Any memorable news you heard first over the radio? 20) Did your family go on vacations? Do you have any special vacation memories? 21) Who was your best friend? What made him/her so special? Are you still in touch today? 22) Tell us about your school days. Did you have any favorite teachers? Did you win any awards or contests? Did you hold any school offices? Did you ever get into trouble? How? Who were your school chums? What did you do during and after school? Have you attended school reunions? What were they like? 23) What activities outside of school were you involved in? 24) What was your favorite holiday (or holidays)? Why was this holiday so special? Describe the sights, smells and sounds associated with this holiday. Describe the activities associated with this holiday. Tell us about your favorite holiday food. 25) Tell us about your wife/husband. How long was your courtship? What quality especially endeared him/her to you? Describe your wedding day from start to finish. How did you feel when you said, “I do”? Where did you hold the reception? What kind of food was served? What are you favorite memories of the day? Describe your favorite honeymoon memories. 26) Where did you live after your marriage? 27) Tell us about your children. What their names and when were they born? What were they like as children? Describe any special memories associated with each. Did you enjoy being a mother/father? 29) What kinds of work did you do as a child and adult? 30) What kinds of work did your spouse do? 31) Describe your military experiences. 33) What activities did you and your children enjoy? 34) Please tell us your favorite family stories and memories. 35) Describe your passions in life. 36) What was the best thing that ever happened to you? What was the worst? 37) What was a difficult time in your life? 38) What helped you survive that time? 39) How did that experience help you become stronger? 40) What did you learn from that experience? 41) How have you made use of that learning in other situations? 42) What life lessons would you like to pass along to your grandchildren? 43) How has you life changed since you retired? 44) What are you looking forward to in the years to come? 45) Looking back, would you say you had a good life? Why? That’s it! I hope these questions helped you.” More from Steve Pender.